Farewelling our Online Marketing Intern Eleanor! The time has come to bid farewell to our wonderful Online Marketing Intern Eleanor Bally. 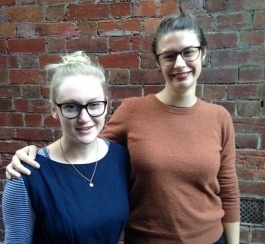 Eleanor has worked closely with Pia and Jess in Regional Arts Victoria's marketing department over the past three months and will be greatly missed by the whole team. You can read Eleanor's insightful relfection on her time as marketing intern on our Inspiring Arts blog, and if you are interested in taking up an internship at Regional Arts Victoria take a look at our current opportunities. Thank you and all the very best, Eleanor!